I use bs player for a long time, mostly with 720p mkv files. Sometimes the video runs slower than audio, sometimes the video freezes and after 3-4 secs it plays normally. Yesterday I tried to play a 1080p mkv file, but the fps was 10-12. When I tried to play again 720p files, the video plays very slowly about 20-21 fps. Which renderer is best for my case? Any other settings I have to adjust? I use an Acer Aspire 8930 Notebook, with Nvidia 9600M GT, 4GB Ram, Windows Vista Home Edition. Do I have to install any external codecs pack, like CCCP? When playng such a file, open preerences -> filters and see if there is a CoreAVC decoder. If so, click on it and disable deinterlace, skip debloking. You didn't mentioned CPU, which is the most important in this moment. There is no CoreAVC decoder, I haven't installed it. As for CPU, its Intel Core Duo P7350 2.00 GHz. I also have noticed that if fast moving scenes there sometimes there is a small freezing of the image. If not, then what is it ? FFDshow video decoder ? There is a FFDshow decoder. BS Player downloaded it during the installation. Do I have to make some special adjustments? I don't have ffdshow installed to guide you, but you must find an option about "disable postprocessing"
Do you think that CoreAVC is better decoder from FFDshow? I'll download a trial version, but How can I activate it? CoreAVC it's lighter on CPU resources than ffdshow. Maybe you can find eslwhere another version to install. 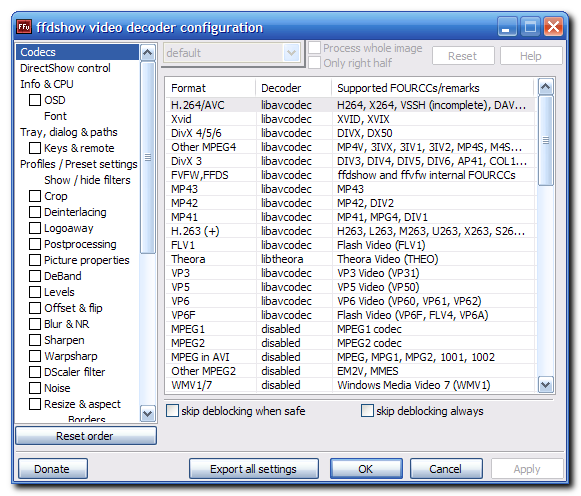 Its true, CoreAVC is faster for decoding H264 than ffdshow, but it is not free. And how this post can be helpful ? Any other advice ? Another free decoder that can be used ? (rightclick >) Options > Properties > Video > FFDshow properties. There you can slide 'postprocessing level' (option at the top of the window). Then click on the [+]-sign in front of 'ffdshow Video Decoder' and subsequently click on 'ffdshow'. ffdshow has (beta) support for multiple processor cores, which should help improve performance. (rightclick >) Options > Preferences > Filter management ? and - of course - in ffdshow disable it for H264. I am using a very old PC its PIII 733 Mhz Intel processor. The VGA card is also built-in. I am unable to play MKV files I also tried by installing CCCP & Matroska pack but of no use. Pls help, and pls don't ask me to upgrade the PC as I cann't afford. Thanks.